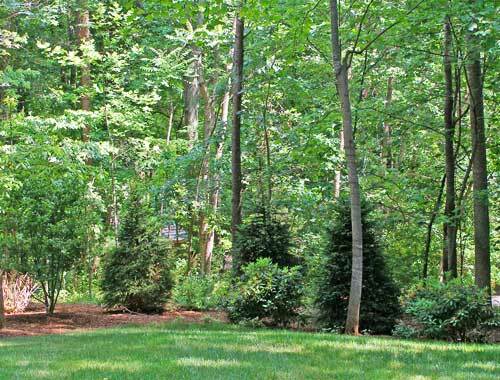 Norway Spruce trees are one of my favorite evergreen trees. They make a great screen when you want to create privacy. Although they look beautiful when they are young, they look even more so as they mature. Stately and elegant is how I would describe them. 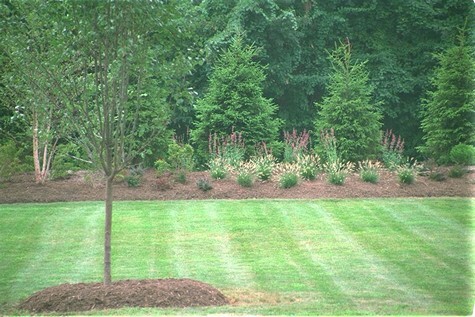 Norway Spruce for privacy planted on a berm. Here they are place at the wood edge for screening through the woods in winter. 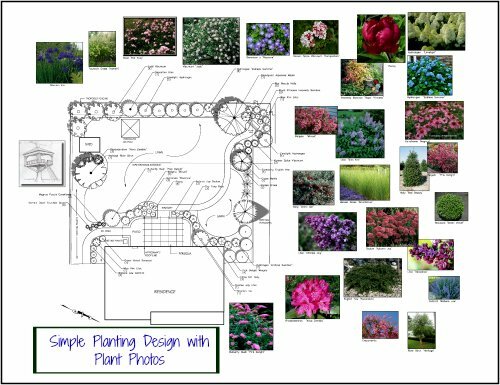 Other plants are added to the design for interest, such as Rhododendron and ornamental trees. 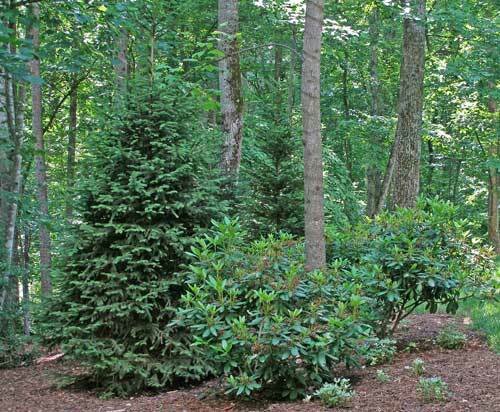 Like many evergreen trees, Norway Spruce trees serve as a wind block from winter northwesterly winds. They are a great dark green color. They have a pyramidal shape, yet the branches become pendulous in later years. Deer do not like this plant! 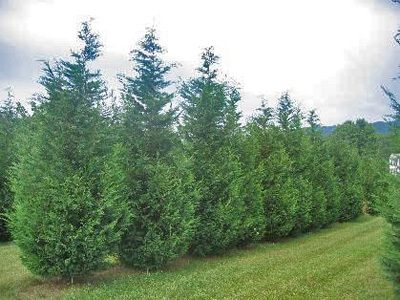 While they love Arborvitae and will eat Leyland Cypress, this tree is typically deer resistant. Trees were planted along the road. 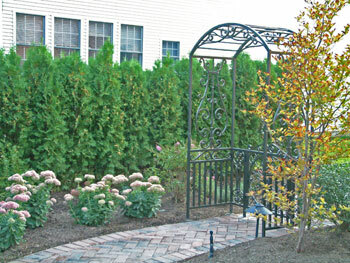 This not only creates a more private front yard, but hugs in the landscape. Noise and wind was also blocked. 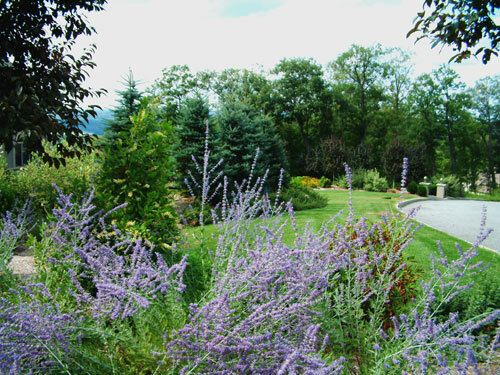 The trees add some privacy to the front yard while Russian Sage lines the driveway. Seen together...a knockout! 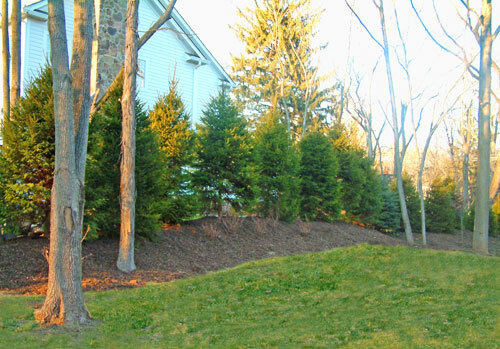 When using Norway Spruce for privacy screening, you can plant them straight in a row or stagger them. 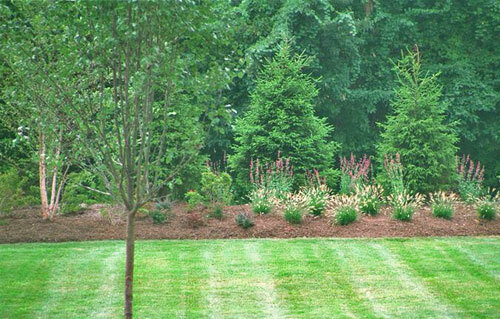 I prefer the latter so that the planting has a more natural look. Also when a tree is set back, in front of it is a nice place to insert a beautiful ornamental tree. Norways will provide a nice dark background for more showy plants which can be placed in front of the trees. 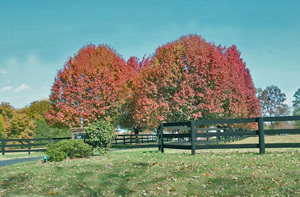 Imagine a red leaf Japanese Maple, a pink Flowering Dogwood, or colorful perennials as shown in the above photo! Although they get very wide over time, they will only grow as wide as there is room for. So if you were to buy them 8 to 10 feet tall, you can easily place them 10 to 12 feet apart...use the 10 feet for immediate privacy. What size should you buy? As big as you can afford!! But seriously, a great size would be 8 to 10 feet tall. Go a little larger for even more immediate privacy and impact, such as 12 to 14 feet. These do get pricey. Purchase them a bit smaller such as 7 to 8 feet tall to still have a nice look. They will get there sooner than you realize.